Grand Central Publishing, 9781455589128, 544pp. For the first time in Earth's history, our planet is experiencing a confluence of rapidly accelerating changes prompted by one species: humans. Climate change is only the most visible of the modifications we've made--up until this point, inadvertently--to the planet. And our current behavior threatens not only our own future but that of countless other creatures. By comparing Earth's story to those of other planets, astrobiologist David Grinspoon shows what a strange and novel development it is for a species to evolve to build machines, and ultimately, global societies with world-shaping influence. Without minimizing the challenges of the next century, Grinspoon suggests that our present moment is not only one of peril, but also great potential, especially when viewed from a 10,000-year perspective. Our species has surmounted the threat of extinction before, thanks to our innate ingenuity and ability to adapt, and there's every reason to believe we can do so again. Our challenge now is to awaken to our role as a force of planetary change, and to grow into this task. We must become graceful planetary engineers, conscious shapers of our environment and caretakers of Earth's biosphere. This is a perspective that begs us to ask not just what future do we want to avoid, but what do we seek to build? What kind of world do we want? Are humans the worst thing or the best thing to ever happen to our planet? Today we stand at a pivotal juncture, and the answer will depend on the choices we make. David Grinspoon is an astrobiologist, award-winning science communicator, and prize-winning author. In 2013 he was appointed the inaugural Chair of Astrobiology at the Library of Congress. He is a frequent advisor to NASA on space exploration strategy, and is on the team for the Curiosity Mars Rover. Grinspoon's writing has appeared in the New York Times, Slate, Scientific American, Seed, Boston Globe, and the Los Angeles Times. 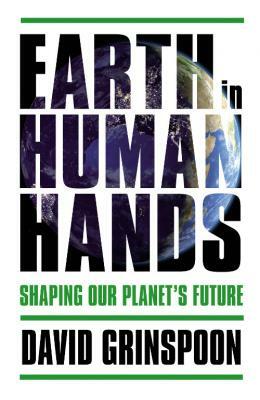 "Now that climate scientists have established beyond a reasonable doubt that man-made greenhouse gases play a major role in global warming, it's becoming transparently obvious that we humans are effectively behind the wheel, driving earth toward its ultimate fate, for good or ill. In the face of this stark reality, one question becomes equally clear: How do we as a species steer the planet in the right direction to save ourselves and our fellow creatures? An astrobiologist by training, as well as a frequent advisor to NASA on space exploration, Grinspoon is well-placed to provide a unique set of answers to this inquiry. In a work that's less an orderly guidebook than a series of thoughtful and fascinating discussions, Grinspoon uses his knowledge of planetary ecosystems and geological change to speculate on humankind's potential earthly influence over thousands of years, pointing out that Homo sapiens has faced extinction before.